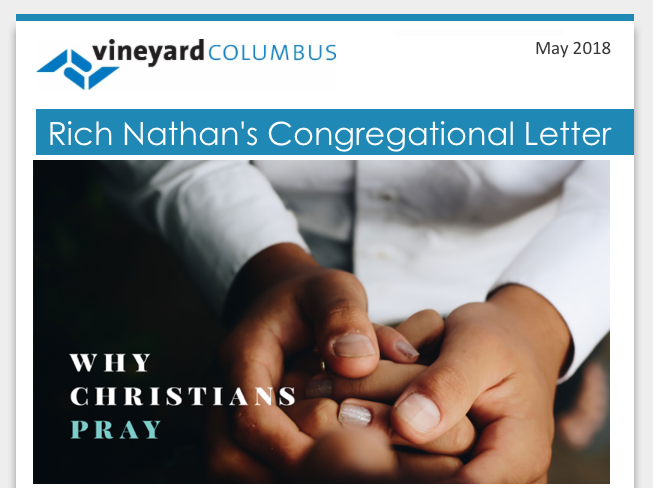 "Vineyard Columbus seeks to be the best friend the city of Columbus has ever had." "Christian prayer invites Jesus Christ into a situation to do what he wants to do." At the age of 24, I was fired from my first job out of law school. It's a long story, but the bottom line is that I was asked to do something that, as a Christian, I could not do. So, at the age of 24, I was out of work with a pregnant wife, a house payment, and no income. Do you think I prayed? You better believe I prayed! I prayed every way I knew how to pray. I claimed God's promises. I prayed in Jesus' name. I prayed in the name of Jesus of Nazareth, the Son of God. I prayed in the name of the Triune God - Father, Son, and Holy Spirit. I prayed loudly. I prayed softly. I knelt down. I stood up. But my mailbox filled with rejection letters. Every law firm in the city had already hired the people they wanted and no one had an opening. For six months, every day, multiple times a day, I prayed. I called law firms everywhere and tried to push my way in. But nothing worked. I was so discouraged. What did I learn? After praying hundreds of times about my job, I learned that prayer is not magic. There isn't a set of magic words or phrases that will guarantee success in a prayer. It is not our intensity or our loudness that will get our prayer answered. God is not a genie in a bottle whom we can control with the right formula. I also learned that prayer wasn't only about changing my circumstances. God had me pray in order to change me. Up until I failed at my first real job, I believed that success in life was primarily due to me and my work. I had always done reasonably well in school and in life. After months of praying for the same thing, I learned I was limited and that there were things I could not accomplish without God's help. There were doors I couldn't open and walls I couldn't punch through no matter how hard I tried. All of those months of praying brought me to the end of myself. Have you ever faced a problem that was too big for you? Have you ever encountered something that you couldn't change by your skills or smarts or hard work? Have you ever come to the end of yourself and been forced by life's circumstances to acknowledge your limits? That's what happened to me over those months. The third thing I learned was that if something was working in my life, or was going to work, it was because God had graciously opened his hand, not because I was so talented, or so skillful. So, when a job finally opened and I began getting a paycheck, I knew down to my toes that the only reason that Marlene and I and our new baby were eating and had a roof over our heads was because God blessed me with a job. Is the purpose of prayer mainly to get stuff – a new car or another job? Have you ever prayed for a sports team? If you are a fan, I'm sure you have prayed for your team to win. Is the purpose of Christian prayer to have our team win or to find a parking spot at the mall, to pass an exam, or to find romance? Certainly prayer includes petitions to God for what we want and need. But every culture and every person from the beginning of time has petitioned God, or the gods. People throughout history have knelt down before the sun or the moon, or before a statue and prayed for what they wanted and needed: rain for their crops, fertility for their herds, victory over their enemies, to have the man or woman of their dreams fall in love with them, to have children. Everyone who has ever prayed, whatever their view of God or the gods, has asked for what they wanted and needed. What is distinctive about Christian prayer? Christian prayer doesn't just ask God for things. Christian prayer invites Jesus Christ into a situation to do what he wants to do. One of the first Christian books I ever read was by a Norwegian pastor named Ole Hallesby and was simply titled Prayer. In this great book, Hallesby defined prayer by quoting Jesus in Revelation 3.20: "Here I am! I stand at the door and knock. If anyone hears my voice and opens the door, I will come in and eat with that person, and they with me." Hallesby wrote: "To pray is nothing more involved than to open the door, giving Jesus access to our needs and permitting him to exercise his own power in dealing with them. To pray is to open the door to Jesus." Just as you began the Christian life by opening the door to Jesus, so you move on in the Christian life by continually opening the door to Jesus in prayer. The way in is the way on. Don't let doubt cause you to keep Jesus at arm's length. Invite Jesus into the doubt. Be honest with Jesus. “I'm really struggling with God's goodness, with God's existence, with God's concern for someone as small as me. Step into my doubt!” When you are tempted, don't let the feeling of temptation create so much shame in you that you hide from God. Invite the Lord into the temptation. “Lord, here is how I'm feeling right now. Here is the thought that just came across my mind. Here's the desire.” You are never going to say something to God which he responds to by saying, “Oh myself (he doesn't say 'OMG'), I didn't know that.” Invite him into your temptation. What is the purpose of Christian prayer? It is to open the door to Jesus and invite him into whatever we are facing, allowing Jesus to exercise his power in dealing with our situation. • by me (Craig Rusbult), Using Prayer for Problem Solving and to Love More Effectively. and a 1-Page Outline (Using Prayer for Effective Living) for half-sermon on May 20. And the Newsletter for April is HOW WE CAN STOP TALKING PAST EACH OTHER.